The measure of any football coach can start with a comparison against his peers, specifically against his own division. 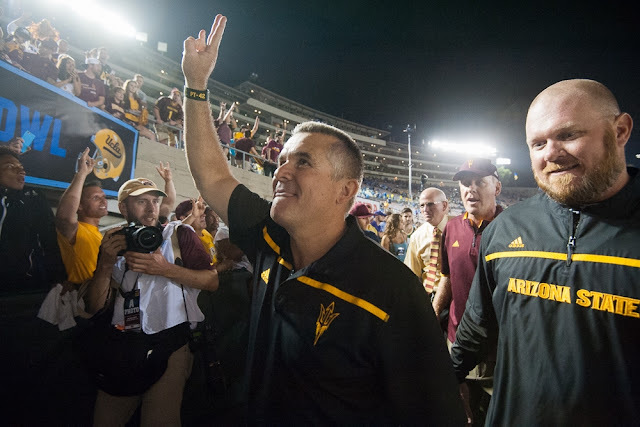 So, here’s a quick look at ASU football Coach Todd Graham and how he has fared against his coaching rivals over three and four year periods in the extremely tough Pac-12 Conference South Division. Now for a look at the record versus the Pac-12 South for the last four years (during Coach Graham’s tenure). * Coach Graham is the ONLY coach in the Pac-12 South with a winning record against every opponent in the South within the past three years. * If you combine the won-loss records versus the Pac-12 South for the past three years, ASU enjoys an 11-4 (.733) mark. * Additionally, ASU has won two of the last three against USC, UCLA, Arizona and Utah. * ASU is undefeated against Colorado. * If you combine the won-loss records versus the Pac-12 South for the past four years, ASU enjoys a 14-6 (.700) mark. * ASU does not own a losing record against any Pac-12 South team in that span. Only ASU and UCLA can make that claim.